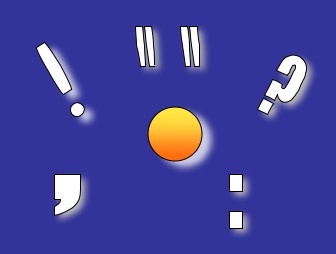 Of all the punctuation marks, periods are perhaps the most basic. Chances are we learned about periods back in primary school when we first began to string words together on paper to form sentences. Not much has changed with the period since then, but there are a few tidbits that bear review and a few uses that occur only on occasion, so they might need clarification. First, the basic function of the period is to end a statement or a command. However, in less formal writing and in fiction, incomplete sentences have become an accepted part of writing. These too end with a period. One popular (and annoying) (over)use along these lines is a string of single word “sentences,” each followed with a period. The forced stop which the period creates is actually an effective way to create clipped speech. However, like so many new creations, many rush to imitate and the sheer volume renders what had been fresh and innovative, tired and cliched. I suggest writers moderate their use of this unique construction. Save it for the right moment when no other way can capture the irritation your character feels. A similar question arises regarding periods and parentheses. The placement here is not as rigid. When a parenthetical expression enclosed in parentheses ends a sentence, the period belongs outside the closing parenthesis. If the parenthetical material is an entire sentence, however, and appears after another completed sentence, the period belongs with the parenthetical sentence and therefore goes inside the final parenthesis. The next most common use of the period is in abbreviations. Again using Chicago Manual Of Style, the rule is to omit the period for abbreviations all in capitals but to use a period after lower case abbreviations. By the way, should an abbreviation requiring a period end a sentence, you do not then add another period. The one does double duty. When given names are abbreviated, a period always follows the capitalized letter.